An Indian citizen was detained from Shibganj Upazila on Saturday morning. 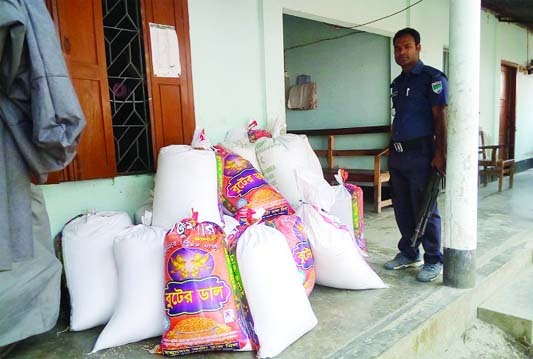 Banirul Sheikh, 33, was detained after entering Bangladesh illegally through Maksudpur border around 8am, said Lt Col Sazzad Sarwar, director of Border Guard Bangladesh (BGB) 53 Battalion. It is unclear why he had come to Bangladesh without valid travel documents. 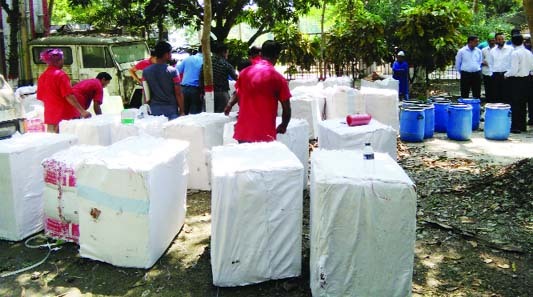 Meanwhile, three Bangladeshis - Abdullah, 42, Al Mamun Reza, 35, Suman, 20 - were detained with 300 bottles of contraband phensedyl in the early hours of the day. All of them are residents of Shibganj's Ghughudanga village. Two separate cases were filed at Shibganj Police Station, Lt Col Sazzad said. RANGPUR: The Rangpur Range of Bangladesh Police has awarded its five personnel and three organisations with medals in recognition of their professional and organisational excellences in discharging duties. Deputy Inspector General (DIG) for Rangpur Range of Bangladesh Police Devdas Bhattacharya distributed the awards at the monthly crime, law and order assessment meeting held at his conference room. The police personnel and organisation received the medals for their laudable performances in handling crimes and maintaining peaceful law and order situation in December last. Superintendent of Police for Gaibandha Abdul Mannan Mian received the best organisational award on behalf of Gaibandha district police. 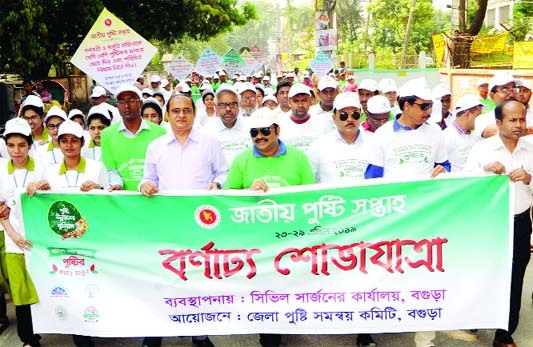 Lalmonirhat district Traffic Unit and Gobindaganj Thana in Gaibandha district were awarded as the two other best organisations. 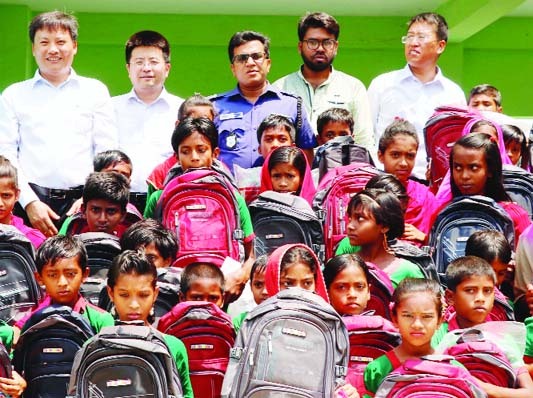 The awarded five police personnel are Additional Superintendent of Police for Dinajpur (Sadar Circle) Shushanto Sarker, Sub-Inspector (SI) Momirul Haque of Gobindaganj Thana in Gaibandha, SI Mamunur Rashid of Jaldhaka Thana in Nilphamari, Assistant Sub-inspector (ASI) Shawkat Alam Siddique of Gobindaganj Thana in Gaibandha and SI Morshedul Alam of Sadullapur Thana in Gaibandha. Additional DIG for Rangpur Range Mazid Ali, Superintendents of Police (SP) from Rangpur, Panchagarh, Thakurgaon, Kurigram, Nilphamari, Lalmonirhat, Dinajpur and Gaibandha districts and other police officials were present, reports BSS..
BOGURA: From the spiritual power and burning desire to learn, Shafiqul Islam, aged 52 , is appearing in the Dakhil (vocational) examination for 2017-2018 academic year, even as one of his daughters is an Honour's student. Like all Dakhil examinees, Shafiqul's exams started on February 2 this year. But unlike his fellow candidates at the Shalfa Technical and BM College exam centre, Shafiqul is a father of three. Locals said Shafiqul, son of late Sonaullah Sheikh of Chandiar village in Dhunat upazila of the district studied at the Hapunia Dakhil Madrasa situated in Sherpur upazila. Talking to UNB, Shafiqul said, "My elder daughter has been studying at Sherpur Town Club Public Mohila College, second one at Bishwa Harigacha College in Dhunat upazila and youngest one in school." Seeing his daughters touched by the light of education inspired Shafiqul to strive to match them, even at his advanced age. "My family members especially the girls always inspire me to take education and say there is no cut-off age for education. Having their support now I am taking my Dakhil examination this year," he added.Exam Centre Secretary Principal Md Yusuf Ali said among 217 students, Shafiqul is the only elderly candidate. Seeing him, others can be inspired to gain admission at advanced age and avail education as Shafiqul proves there is no cut off age for education, the secretary added, reports UNB.